Carrot Orange Vintage Dresses first appeared on Chictopia's streetstyle gallery in Spring 2012 seen on Downtown Los Angeles blogger zozocouture of grandtheftthrift.blogspot.com. She styled her carrot orange vintage dress with a orange vintage scarf. Since then, Carrot Orange Vintage Dresses have grown in popularity as bloggers from Los Angeles, Detroit, and Oakland have discovered them. 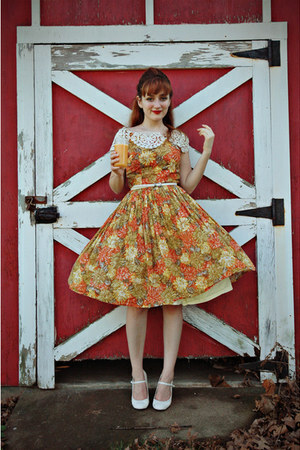 Carrot Orange Vintage Dresses are generally seen in vintage, 60s, and chic style. Popular types of Carrot Orange Vintage Dresses are floral print, vintage rust colored dress, floral maxi, pucci-esque patterned maxi dress, and bandage. There are currently 24 streetstyle photos of bloggers wearing Carrot Orange Vintage Dresses.